You knew this, right? 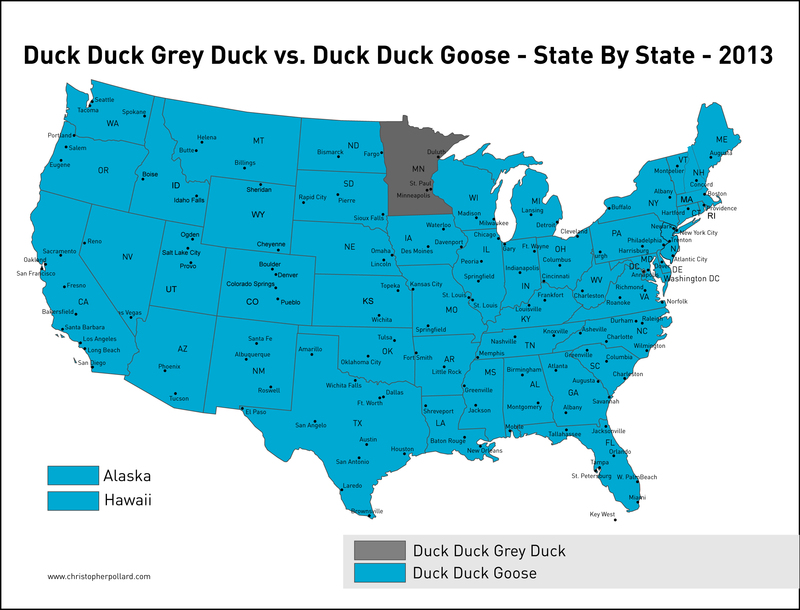 In Min­neso­ta chil­dren play a game called Duck Duck Gray Duck, where­as in the rest of the US they play Duck Duck Goose. I’m just learn­ing about this game; where I grew up (in Mary­land) we had nev­er heard of either one. The sec­ond time was a cou­ple of months ago fol­low­ing a Vikings-Bears game in Chica­go, when the Vikings mimed a quick game of “DDG” in the end­zone after a touch­down. Nei­ther the Vikings quar­ter­back nor the wide receiv­er involved in that play grew up in Min­neso­ta, so both (mis­takenly!) referred to the game as Duck Duck Goose. The Strib and the PiPress both wrote about the ensu­ing con­tro­ver­sy. Phys­i­cal game­play is iden­ti­cal in the two game vari­ants. The only dif­fer­ence lies in what the child who is it says. It walks around a cir­cle behind the oth­er chil­dren, who are seat­ed fac­ing inward. S/​he taps each child on the head and says “duck” (or “adjec­tive duck”) until, for the next intend­ed vic­tim, it utters “gray duck” (or “goose”). The vic­tim then jumps up and pur­sues it around the cir­cle, and if it man­ages to reach and claim the victim’s for­mer seat (which almost always hap­pens), the vic­tim becomes it. Lath­er rinse repeat. Clear­ly DDGD is the deep­er and more sub­tle game. Writ­ing in a forum for Eng­lish-lan­guage enthu­si­asts, one Min­neso­ta native recount­ed the sto­ry she heard as a girl as to why DDGD is the prop­er form (and the rest of the coun­try has it wrong). This writer did not pro­vide a source link. Anoth­er the­o­ry float­ing around is that the game we play in Min­neso­ta came from Swe­den, where chil­dren play a game called, alter­na­tive­ly, “anka anka grå anka” or “anka anka gås.” The the­o­ry goes that the Swedish immi­grants who made their way to Min­neso­ta hap­pen to have been raised on the “gray duck” vari­ant. We can get some idea as to the preva­lence of the two game names by ask­ing Mis­ter Google. Google​.com gives us a view into the Eng­lish-speak­ing world, but with a lit­tle effort we can ask about Swedish and oth­er pos­si­ble Scan­din­avian vari­ants. (Note that Swedish is the only for­eign ver­sion I encoun­tered in my research; the puta­tive Nor­wegian and Finnish vari­ants come cour­tesy of Google Trans­late.) While we’re at it, let’s also fold in the vari­ant Eng­lish spelling gray/​grey. Google does not seem to want me actu­al­ly to use google​.se, google​.no, or google​.fi — when I vis­it those region­al sites and ini­ti­ate a search in a non-Eng­lish lan­guage, google​.com pro­vides the answer (in Eng­lish). So to per­form the search­es shown I used a VPN to issue the requests from Stock­holm, Oslo, and Kris­tiansand respec­tive­ly. Peo­ple of Swedish ances­try make up 9.6% of Minnesota’s pop­u­la­tion; Nor­we­gian descen­dants are more com­mon at 16.5% and the Finns trail at 1.2%. Anoth­er source claims that peo­ple of “Scand­i­nav­ian” descent (by some def­i­n­i­tion) make up 31% of the state. Round­ing out the pic­ture, Ger­man descen­dents account for 38.6% of Minnesota’s pop­u­la­tion and Irish for 11.4%. The fact that DDGD “wins” the Google con­test, despite Minnesota’s lone­ly cham­pi­oning of it, might sim­ply mean that Min­nesotans talk about it more, because they care more about their icon­o­clas­tic stance. Sort of like the way we obsess about things that were invent­ed here. Speak­ing of gray/​grey, Google Books offers an ngram view­er to com­pare the pop­u­lar­i­ty of words or phras­es in var­i­ous Eng­lish cor­po­ra from 1800 to the present. Thus we find that “grey” has always pre­dom­i­nat­ed in British nov­els, but “gray” took over in Amer­i­can lit­er­a­ture before 1830 and has been dom­i­nant ever since. If you didn’t already know about the Google ngram view­er, you have my apolo­gies for the loss of the sev­er­al hours of your life that you are about to spend there. Min­nesotans have embraced DDGD for nam­ing all kinds of things. For exam­ple the for­mer 128 Restau­rant in St. Paul (now Stewart’s) used to run a food truck named Duck Duck Gray Truck. There’s the recent­ly opened Gray Duck Tav­ern in the Lowry Hotel in St. Paul. The U of M boasts an Ulti­mate Fris­bee team call­ing them­selves the Min­neso­ta Grey Duck (they spell it with the “e”). Gray Duck Stu­dios stands ready to meet all your child pho­tog­ra­phy needs. The founder of the pri­va­cy-pro­tect­ing search engine Duck Duck Go, Gabriel Wein­berg, has said that the name was inspired by Duck Duck Goose. Obvi­ous­ly he didn’t grow up around here. Did you play this game as a child? What did you call it? A few more data points: my neigh­bor Decaf Doug, who was born in St. Paul and raised in Cam­bridge, played DDGD. His wife Judy from Hib­bing was aghast when she learned about DDGD: Hib­bing is all about DDG, so she says. Their son grew up in St. Paul on DDGD. His girl­friend was a camp coun­cilor in both MN and WI and they were taught both ver­sions. And yet more: Decaf Doug’s oth­er son had the best response to my sur­vey. When asked "gray duck or goose" he shot right back, “You can't be seri­ous.” (DDGD obvi­ous­ly.) Two oth­er Christ­mas Day vis­i­tors, both of whom grew up in St Paul and one of whom is a retired ele­men­tary school teacher, were firm­ly in the gray duck camp. A game show con­tes­tant lost the round when he said “duck, duck gray duck.” I was shout­ing unfair to the TV. Yeah, that ques­tion real­ly shouldn’t have made it onto the show!